On November 16, DC Comics is publishing two different reprints of the Denny O'Neil/Neal Adams Superman vs. Muhammad Ali (1978), one labeled "facsimile" and the other "deluxe". (These are already listed as Amazon pre-orders.) The 80-page hardcover facsimile edition reprints the comic at its original trim size of approximately 10 inches wide by 13.25 inches high. 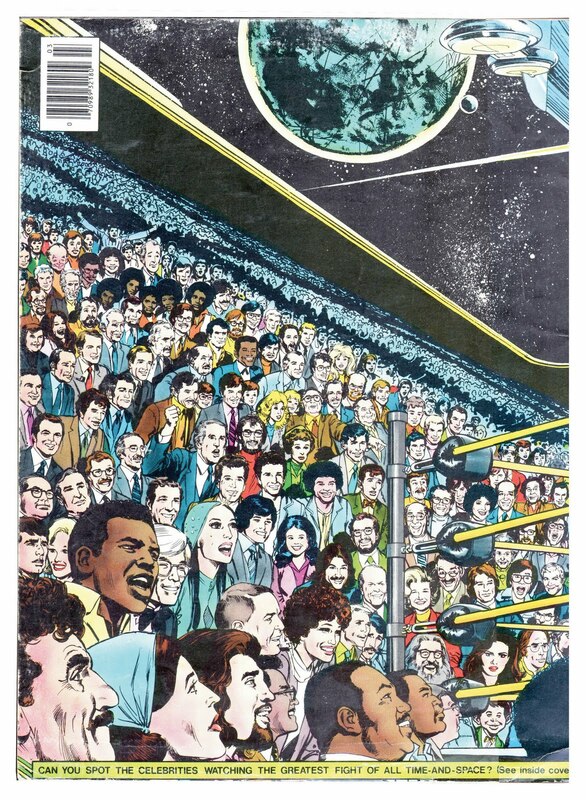 The 96-page hardcover deluxe edition promises unpublished developmental artwork and other bonus features. 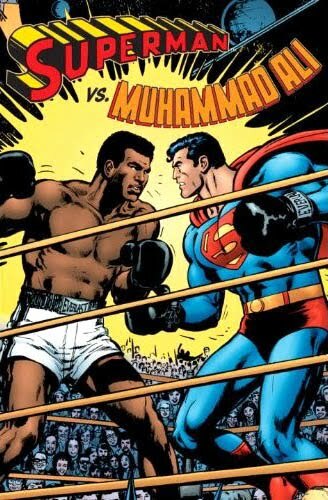 Neal Adams talked about the year-long creation of Superman vs. Muhammad Ali in this 2006 interview. 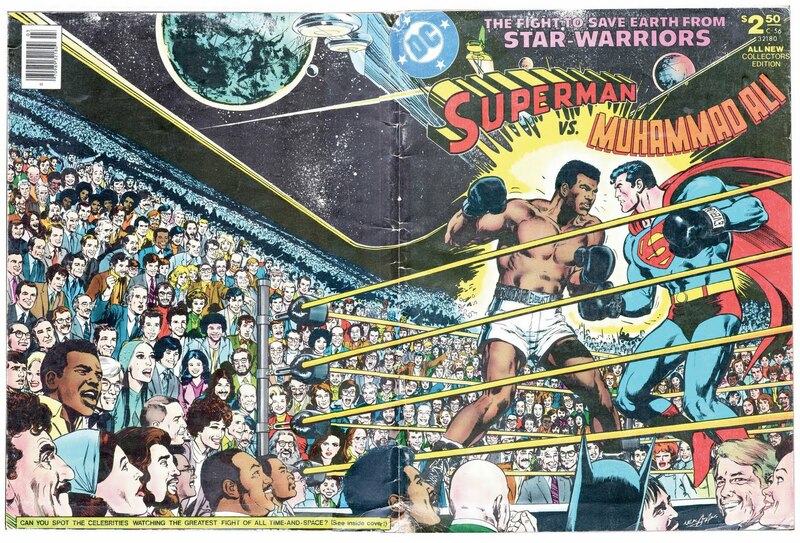 When I worked at DC Comics during the 1990s I used to walk down a hall where the framed cover of that comic book was displayed. I would stop and study the faces in the crowd scene. 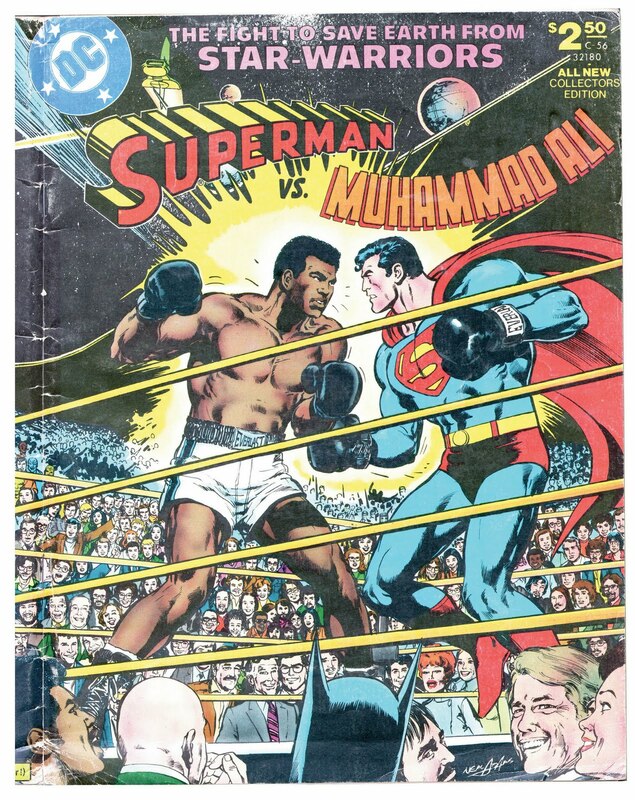 Some people, such as Flo Steinberg (#5), Archie Goodwin (#15), Vince Colletta (#113), Ralph Reese (#137) and Larry Hama (#138), I had met before I began at DC. Others, such as colorist Bob LeRose (#77), Julie Schwartz (#81), production head Bob Rozakis (#121) and Trevor Von Eeden (#139), I met while working at DC. One day I turned over my stapler and was surprised to see a typewritten name taped to the underside. The stapler had once belonged to DC editor Murray Boltinoff (#119). 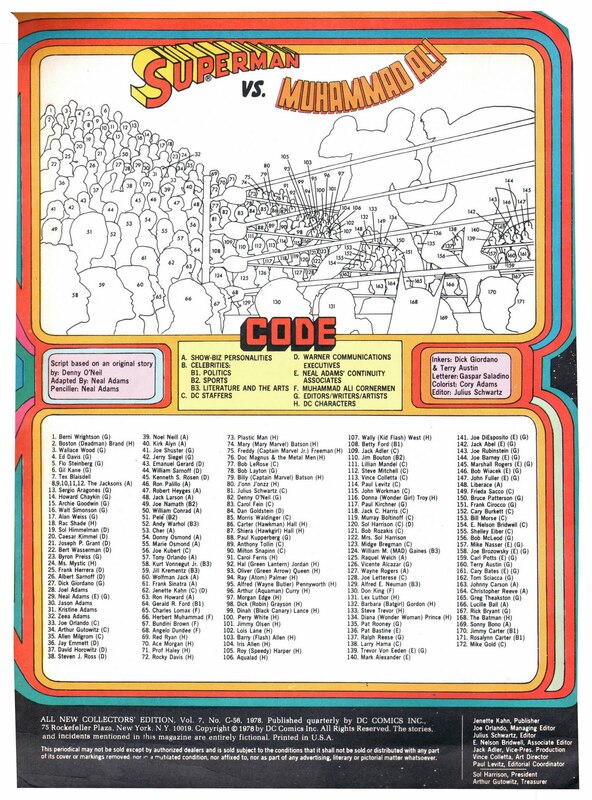 The code with numbers was a fascinating device, and it gave me the idea of doing something similar when I edited the DC/Skybox Cosmic Teams trading cards (1993). To identify the individual characters in the various teams, I designed the card backs to show outline drawings with a match-up of identifying names and numbers. Further, these cards employed a triptych effect in which three cards could be butted together to frame one image. Of all the triptych cards, the best was the Justice Society of America. With remarkable atmospheric perspective, Joe Kubert drew the Justice Society winning World War II with what appears to be the entire Allied invasion of Normandy in the background. The Potrzebie restoration of the Galaxy Science Fiction wraparound cover with the outline names/numbers map brought some favorable reactions, so I thought I would try this again. This time the problem is not only the huge size necessary to see all the names, numbers and faces but how to see faces/names/numbers simultaneously. It's awkward. One solution would be to open multiple windows. Another would be to print out the sheet with the names and numbers. At any rate, keep clicking. A series of three clicks will eventually expand these images so they are very large and legible. 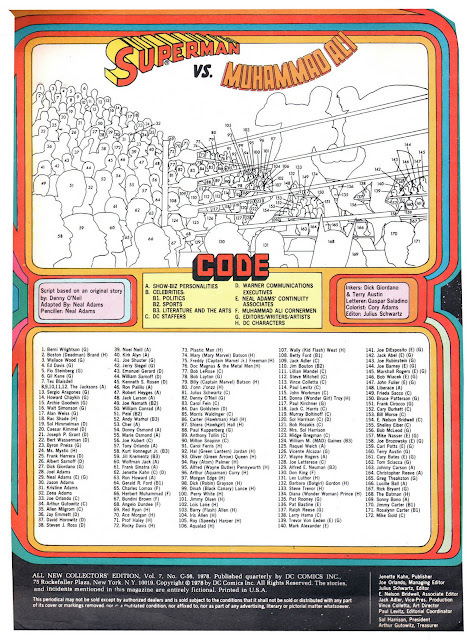 In addition to the show biz people, I see Wally Wood, Flo Steinberg, Sergio Aragons, Steve Mitchell, Alan Kupperberg, and Mike Hinge.